Do you ever have those days when you’re totally unprepared when dinner time rolls around? I find that unless I plan out the week’s meals in advance over the weekend it’s bound to happen to me. It happened again last night, but I had a semi-plan. I had a random pork tenderloin in the fridge… Here’s what I did with it. Typically, if I’m making a pork tenderloin I’ll set it to marinade in some mixture the day its due to be grilled or baked. As I said before though, this week’s been one of those totally unprepared, fly-by-the-seat-of-your-pants weeks because my boyfriend’s co-worker from London was in town. Between going out to dinner many nights, and giving him a taste of everything Atlanta has to offer, I didn’t have a whole lot of time (or inclination) to try to meal plan and cook like I normally would on the weekend. So there I was, yesterday morning, pork tenderloin in the fridge, needing a plan for dinner. Stir-fry popped to mind, but then the question was: what kind? Asian? Indian? Something else? A little perusing of various recipe sites sparked an idea: let’s make it spicy, but Southern California spicy: cumin, jalapeno, cilantro – something different. Hence, my Baja pork stir-fry was born. Peppers, onions, jalapeno for heat (no seeds though – too much heat for me) and in no time at all, you’ll have a healthy, flavorful stir-fry dinner on the table. Combine the chicken broth, corn starch, cumin and garlic. Julienne slice the peppers, onion, and mince jalapeno and set aside. Slice the pork tenderloin into 1-inch chunks, and set in a bowl. Sprinkle pork with 1/4 tsp. of sea salt and 1/4 tsp. of black pepper, and stir to coat. Heat a large skillet over medium-high heat and add 1 tbsp. of canola oil, swirling to coat skillet. Add pork and cook for 3 – 4 minutes, browning on all sides. Once pork is cooked, remove from skillet for now. Heat the pan back up over medium-high heat, add the remaining canola oil and add onion to the skillet. Stir fry for 1 – 2 minutes. Add the bell peppers and jalapeno and stir fry for another 1 – 2 minutes. Return pork to skillet and stir fry / reheat for 1 minute. Stir in broth mixture, remaining pepper and salt (only if needed), and bring to a boil. Once sauce has thickened a bit, remove from heat. If adding cilantro, stir it in now. Prepare rice according to package directions. Divide rice among 3 – 4 plates and divide pork tenderloin stir-fry evenly. Dinner’s served! With some brown rice or noodles, you’ve got a quick, healthy meal in no time. 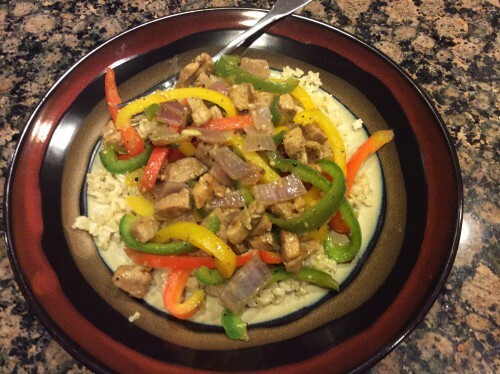 This entry was posted in Entrees, Recipes and tagged Baja, Baja Pork Stir Fry, Baja Stir-fry, Dinner, Easy, Entrees, Healthy, Jalapeno, Pork, Pork Stir-Fry, Pork Tenderloin, Quick, Recipes, Stir fry on October 29, 2014 by Paige N.. I'm a girl with a love of food and travel. Please follow this new blog as I share my passions with you, and feel free to share yours with me. Hope you enjoy! P.S. All opinions here are my own.